Everyone naturally loves music and this life-long love usually begins when we are children. The earliest signs are usually seen when a baby rhythmically bounces to the sound of music or their delightful smile when a favorite song is heard. 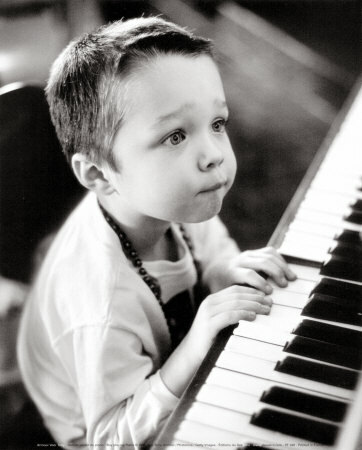 My goal as a piano teacher is to help children become life-long piano players. It always saddens me to hear of someone who took years of lessons and played at a high level but “haven’t touched” a piano in years. So, as a parent, you may have been considering whether or not your young child should take piano lessons. I hope that this page will help you in making that decision. What is a Good Age for Children to Start Piano Lessons? I am often asked this question by parents of young children, ages 5 to 10. (go here for older children). Based on my experience as a music teach for several decades, there are several readiness signs that I look for to predict success in a young piano student. There is actually a lot of “reading” involved in learning to play the piano. Instead of reading letters and words, at the piano your child will need to read notes. Children who already have had success reading age-appropriate books will have a better chance of reading piano music. If your child is an early reader that is a very good sign. If they aren’t, certainly waiting a year or two until their reading skills improve will not hinder their life-long enjoyment of playing the piano. Playing music requires a lot of concentration. Even when playing for a large crowd, professional musicians are often in “another place” as they are focused almost entirely on the sounds that they are making. This is true for all styles: Classical, Jazz, Country, Pop, etc. Obviously, your child will not yet possess that level of concentration. But part of their musical training will be learning how to begin to get into that special place where the player and the music become one. Now this may seem contradictory, but it has been my experience that children who have difficulty concentrating but who are really good in the other areas discussed here do great taking piano lessons. The self-discipline and the necessity of focusing to make a song sound good are very helpful for “hyper” children. Is Your Child Physically Developed Enough to Play Piano? Playing the piano is a very physical activity. Most people don’t realize this because, well pianist are always sitting and, the good ones make playing the piano seem “effortless.” TO make this relate-able, the physical effort involved in playing the piano is very similar to typing. Any adult, after an hour of non-stop typing will be tired. Now, your child certainly will not be expected to exert them self at an adult level, but, thinking of the physical development of your child’s fingers, hands and arms: Can you imagine your child having the strength to play the piano for a minute or two? Of course, part of taking piano lessons will be the development of many fine muscles in your child’s hands, arms, shoulder, back, etc. The more developed these muscles are in general the better their piano lesson experience will be. Maybe you already have a piano in your home. Does your child like to play on it? When they do is it for more than a second or two? Do they seem to enjoy making sounds on the piano for maybe a minute or two at a time? To help you get started, I am happy to offer you a FREE first piano lesson with me. This half-hour piano lesson will give us a chance to meet each other and for me to find out what your personal musical goals are. You can sign up for your free piano lesson here. After your first free piano lesson, I also offer a special $5.00 discount on your next four piano lessons as we both continue to get to know each other and you find out what studying piano with me is all about.